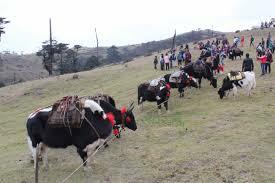 Fidim–Yak festival was organised at Falelung rural municipality-4, Charrate in Panchthar on Sunday. The festival, organised to promote tourism through yak, had showcased yak related products and goods. Minister for Economic Affairs and Planning of State-1, Indra Bahadur Angbo inaugurated the festival where hundreds of yaks were kept for exhibition. The minister stressed the need to manage yak rearing for tourism promotion as well. Mausam Dhungel, Chief Administrative Officer of Falelung rural municipality, said the festival was organised to impart a message to contribute to increase local people's income by promoting tourism through yak rearing, develop yak culture, promote yak related products, protect endangered wildlife and herbal plants and lessen risks of environmental and climate change factors. According to a study carried out by the rural municipality, there are 504 yaks in 21 sheds in Falot area of Falelung. Around 100 people are directly or indirectly engaged in yak rearing. The yak festival site is located in an altitude of 3,400 metres from sea level. Peculiar dance of yak farmers was the special attraction in the festival. Even huge number of people from neighbouring India, China and Bhutan, beside eastern districts of Nepal, came to observe the festival.